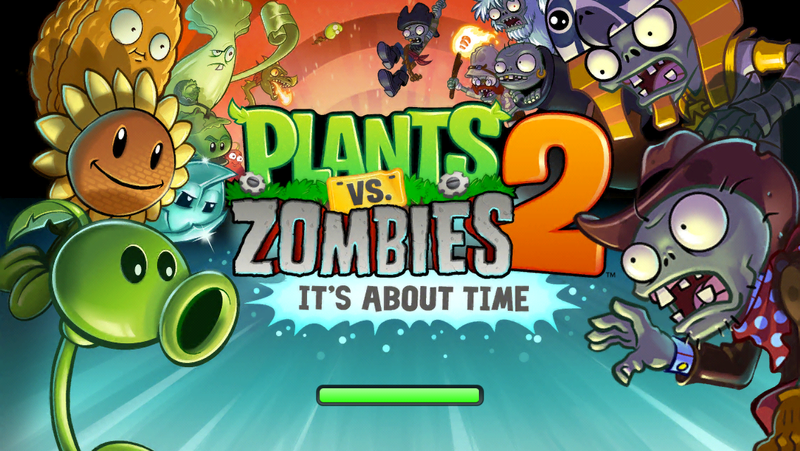 EA and Pop Cap finally released the sequel to the highly addicting mobile game Plants Vs Zombies 2: It’s About Time. Everything you loved about the first Plants vs. Zombies is back in full force with a slew of additions like new plants, power-ups, mini games, and zombies! Plants Vs. Zombies 2 offers hours of game play for those who have completed the first and were left wanting more, or for those that have never even tried the game. Its a quick fix when your on the go, highly addictive, and…..Free?? 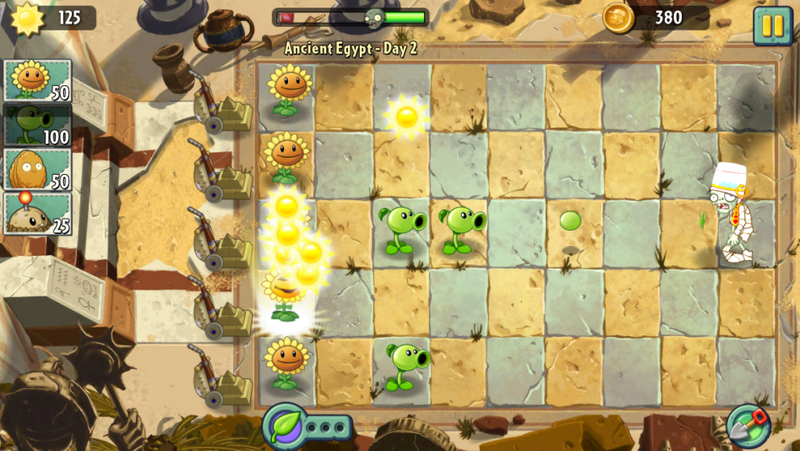 The game and strategy of Plants vs. Zombies 2 is very similar to the first. 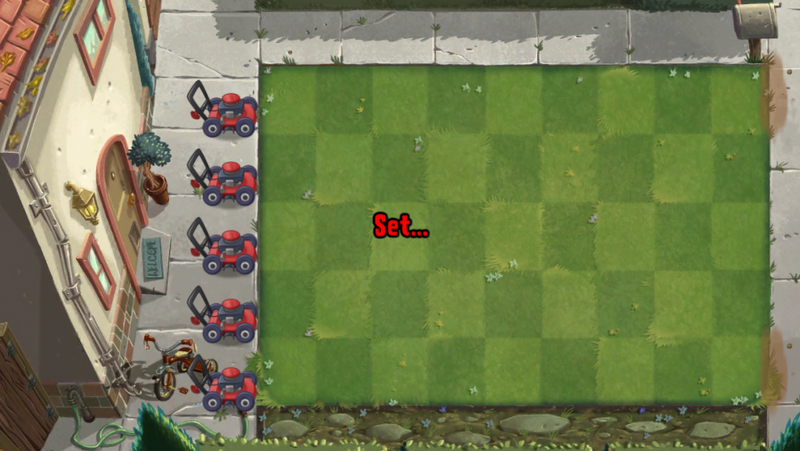 The board is laid out in a 9×5 tile grid where players must plant offensive and defensive plants to protect their home against an onslaught of Zombies. I, like most players, start by planting a few sunflowers to collect some resources, sun power, then plant some simple pea shooters when the first zombie walks on screen and build up form there. I can hear it now “but mark how is this different from the first?”. Well short answer is…Its not…Why fix something that isn’t broken? The first Plant vs. Zombies was wildly addicting and amusing! In fact I, along with many others, beat everything in the game, and then replayed the main story….because it was that fun! It is a simple yet difficult game that you can pick up and play any where, you can sink as little as 2 minutes into it, or as long as you like. There is no penalty for pausing and returning to the app later (At least that is the case on iOS, not sure how the other platforms handle multitasking). The differences of Plants v.s Zombies 2 are in the details. Plants Vs. Zombies 2 starts off with an actual story, unlike the first where you were left to defend your house. The story, which fits the game’s tone perfectly, has you planting your way thought time with Crazy Dave as he attempts to go back in time to eat his taco again. He attempts to go back only 5 minutes, but instead you end up in ancient Egypt, where you must plant your way though different time periods to move forward. Each time period brings different variations of the Zombies, which in turns adds a lot more strategy to the game because you never really know what to expect. This is one of the biggest differences in the game that I have noticed. At the end of a level you are presented with a path…Much like a typical Mario game, where you must choose which way you want to go to proceed. Some challenges may be more difficult, but they may also provide you with a short cut or a new plant/power. 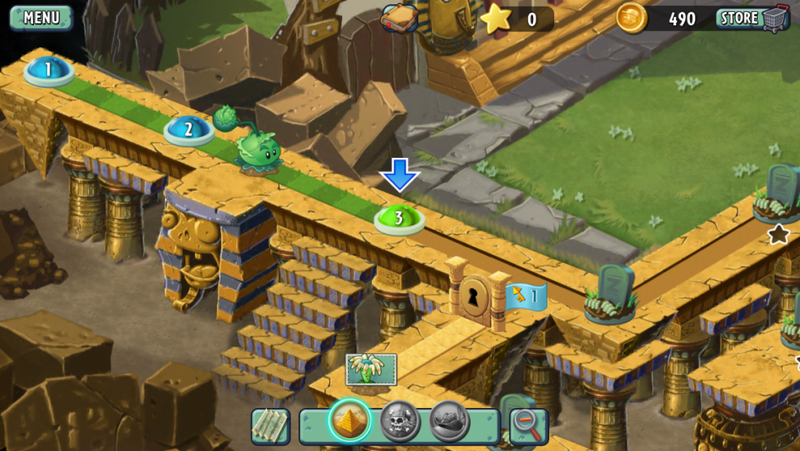 The next large addition to Plants Vs. Zombies 2 are the various power ups. 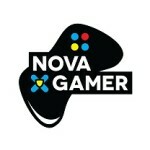 The team have added 3 power ups to the game which you can purchase with in game currency. They are designed to be used when you are in a pickle and just cant seem to get past a stage. They are fairly expensive, ranging from 800-1200 coins, considering coin drops are relatively rare. You will get coins every level, but the drops are usually is small denominations. This gives you the illusion that you are collecting a lot when realistically you are not. You can purchase coins in the store at any time as well…but I’ll come back to this later on in the post. Personally I do not use these power up as I feel like I’m cheating when I do. The second from of a power up is called plant food. This drops off of zombies that glow green and can be used to very briefly buff a single plant. The plant food dose not carry with you to the next level, so trying to save them is pointless! The plant food is also used to get you out of a pinch, however their use is much more strategic! Rather than clearing all the Zombies on the screen the plant food will help out one plant to get you a head a little bit. Whether or not it is to buff a sun flower for a burst of resources, or to have a pear shooter freak out and fire 100′s of shots, they only last about a second and do not feel over powered. I have expressed my views a few times in our SuperNova Cast so I will only touch on my thoughts towards this. The Plants Vs. Zombies 2 store offers what most “freemium” games offer, early upgrades, coins, and power ups, but it never forces you to buy items in order to proceed. The temptation is there because some levels are hard…that being said Plant vs. Zombies 2 is a strategy game and is meant to test your skill! In the end the developer is giving you a game for free and leaving it up to you, the player, to pay what you want/feel you should. It is no different then a store giving you a free sample then handing you a coupon. Using this same example a Supermarket will NEVER give you a sample or an item then demand you buy in order to leave the store…I mean this is down right dirty and against so many violations it is not even funny…But I will save this for a rant! Moving on, The Plants Vs. Zombies Store dose constantly remind you that the store is there, and will get you to visit it several times, but never demands that you make a purchase you do not want too, or puts you in an unbeatable situation. All in all Plants Vs. Zombies 2 is a very welcome addition to the mobile platform. It offers hours and hours of fun and is absolutely free if you want it to be. I for one am going to get many MANY hour out of the game play and likely wont have to spend a cent!